Real Sociedad have conceded 25 goals in 22 league appearances this season, out of which 10 goals were conceded when Diego Llorente has started in the heart of the back four. The defender has started in only 11 matches and since he became a regular from the start of November, he’s cemented his place in the side and at the same time drawn attention from other clubs. 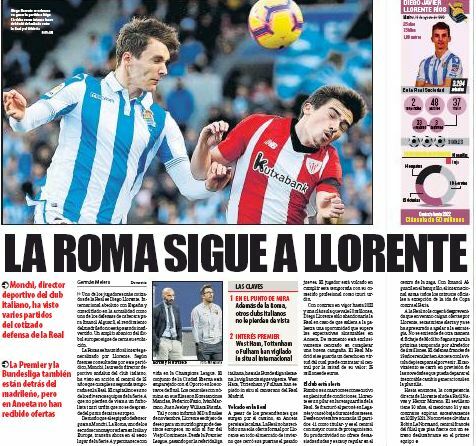 Wednesday’s edition of Mundo Deportivo explains in detail that AS Roma sporting director Monchi was watched the 25-year-old in action, while three clubs from the Premier League also get a mention. This includes Fulham and West Ham United, and the report claims the London outfits have been monitoring the player. In the recently concluded winter market, Sociedad never received a bid for Llorente, who arrived at the club from Real Madrid in 2017. His current deal runs down in 2022 and has a release clause of €50m in the contract. 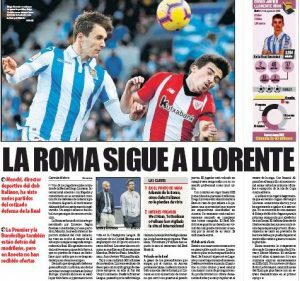 Mundo claims Llorente will only leave the La Liga outfit if there is a proposal that ‘exceeds the achievable expectations’ of Sociedad. Real Madrid are also keeping an eye on the Spain international and they have an option to re-sign Llorente for €25m. That sounds a better deal that West Ham or Fulham paying €50m.